Turn on any television lately, and there are a myriad of programs to inspire homeowners. Whether the program is a total home makeover, a celebrity kitchen makeover or an educational program that objectively weighs the pros and cons of surface materials, one product has received more air time than any other—Silestone by Cosentino. Made from quartz, Silestone has obtained rock star status for good reason, having been featured on over two dozen Extreme Makeover: Home Edition, five recent HGTV Dream Homes, highlighted on the Discovery Channel, selected for the Dream Kitchen Makeover by Rachel Ray and most recently featured on Good Morning America. This award-winning countertop has garnered the attention of celebrities and design professionals alike, for its durability, beauty and affordability. 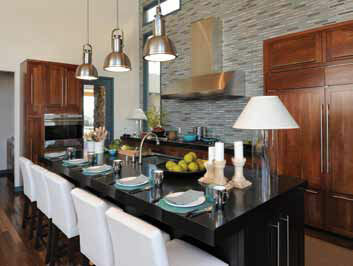 For HGTV, Silestone, was a proud sponsor of the 2010 Dream Home Giveaway in New Mexico. There they collaborated with the HGTV house planners and designers to incorporate Silestone throughout different areas of the home. This year’s HGTV Dream Home featured stunning handpicked Silestone products for the kitchen countertops, master bath vanities and walls; as well as Eco by Cosentino recycled surfaces for the secondary bathrooms. For more information, call Stone System of North Carolina at 704-238-1659 or visit them on line at www.stone-systems.com or www.cosentinonorthamerica.com. Silestone quartz is available nationally in over 65 colors and offers a 15-year limited manufacturer’s warranty.